Released back in 1973, Perfection was an immediate hit and still remains pretty popular to this day. The basic premise behind Perfection is that there is a gameboard attached to a timer. The gameboard has 25 different spaces and the goal is to place the corresponding piece into each space before the timer runs out and pops up the pieces. Seeing Perfection’s success, quite a few other companies tried to capitalize on the popularity with their own game. One of these games was the 1975 Milton Bradley game Numbers Up. 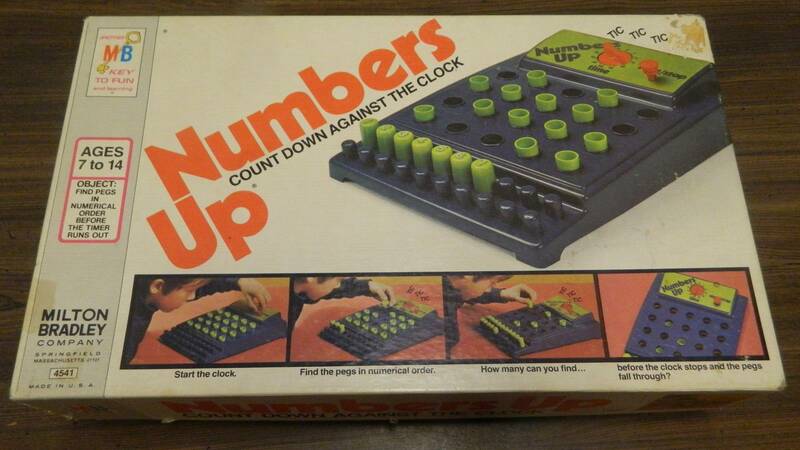 Numbers Up takes the timer gameboard from Perfection and adds in a number mechanic. Numbers Up is an occasionally fun little speed game that gets repetitive pretty quickly. Press the timer button down to turn off the timer. Set the timer to the desired amount of time. 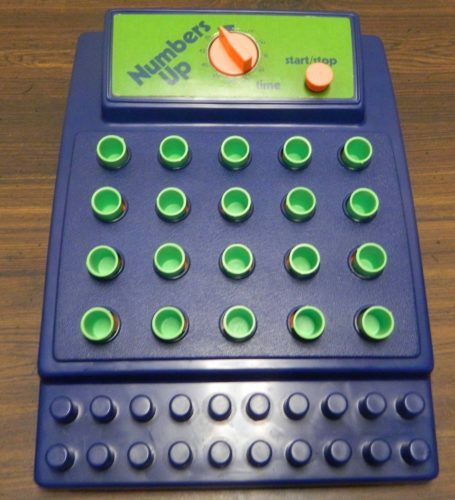 One of the players, who isn’t the current player, will randomly place the number pegs into the holes in the gameboard. When all the pegs are in place, the gameboard is set. When the current player is ready, the timer button is pulled up which starts the timer. The current player will choose one of the pegs and pick it up. They look at the number. If the peg is not the “1” peg, it is placed back in the hole that it was taken from. This player picked up peg eleven. As this wasn’t the peg they were looking for, they place it back in the same space on the gameboard. The player will keep looking at pegs until they find the one peg. When they find the peg, they will place it on the first peg on the bottom of the board. The player will then try to find the “2” peg and so on. The player has found the one peg. They take the peg and add it to the bottom of the gameboard. The player continues until the round ends. The round can end in one of two ways. 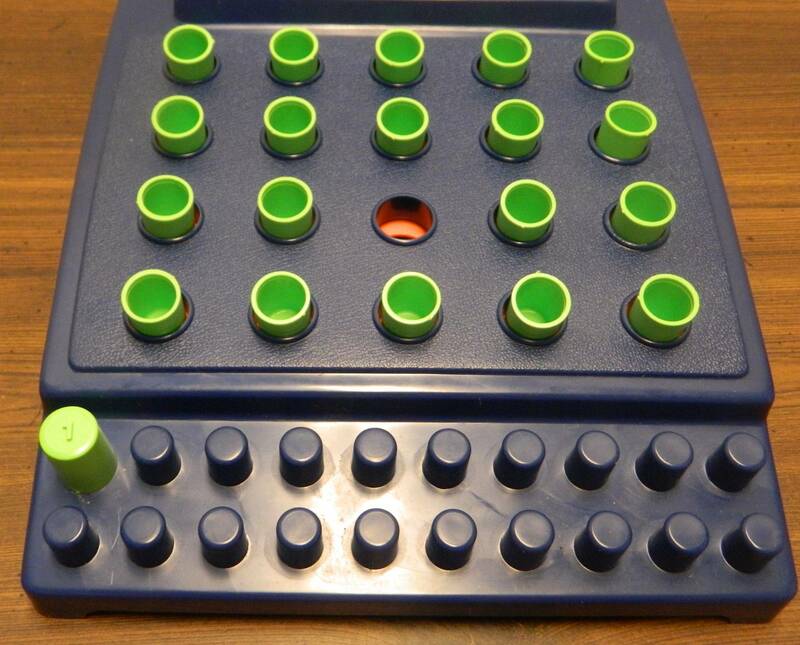 If the player was able to place all 20 pegs onto the pegboard section of the gameboard, the round ends with the player receiving a perfect score. They stop the timer as quickly as possible noting how much time they have left. 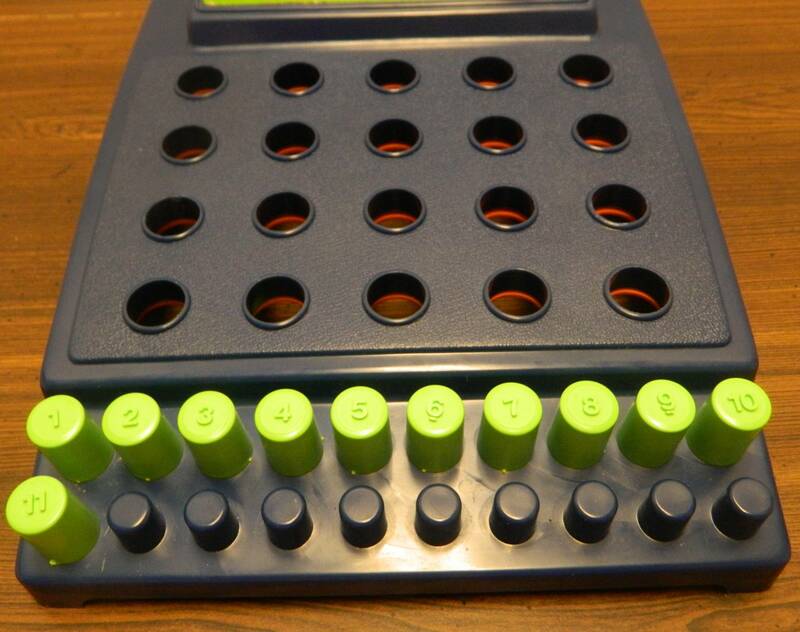 If the timer runs out, the round ends immediately as the pegs drop below the gameboard. If the player has the correct next peg in their hand, they can add it to the pegboard. The player then counts up how many pegs they were able to place. This is their score for the round. This player was able to place eleven pegs before they ran out of time. They have scored eleven points. The next player will then take their turn. The gameboard is reset with the same amount of time added to the timer and all of the pegs randomly being placed into the holes. The game ends when all of the players have had one chance to play. The player who was able to place the most pegs, wins the game. If two or more players are able to place all 20 pegs, the player who placed all 20 pegs quicker will win the game. 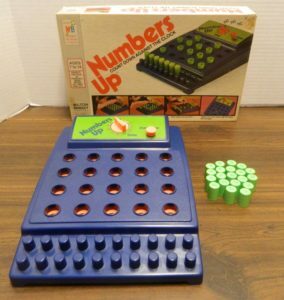 While it is not exactly like Perfection, it is pretty obvious that Numbers Up took inspiration from games like Perfection. The gameboard is pretty similar to Perfection as in both games players are racing against the clock to complete their task before they run out of time. The big difference between the two games is that instead of focusing on finding matching shapes, Numbers Up focuses on numbers. In Numbers Up you pick up the number pegs as quickly as possible trying to find the lowest remaining peg. If it is not the lowest remaining peg, you have to return it to the space you found it. 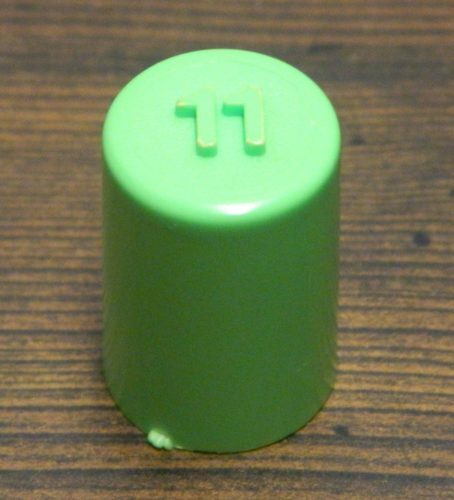 When you find the lowest numbered peg, you place it on the bottom of the gameboard and then move onto the next number. I think the best way to describe Numbers Up is to say that it is a combination of speed, memory, and some luck. I would say the most important aspect of the game is the speed element. If you want any chance of doing well in the game you have to be quick. Most of your time in the game is going to revolve around picking up, looking at, and then returning the pegs as quickly as possible. A player that can look at the pegs quickly is going to have a big advantage in the game. If you can’t go through the pegs quickly, you are going to have a hard time with the game. In this regard Numbers Up is a lot like most speed games. If you like speed games, you can have some fun with Numbers Up. People who don’t like the stress of being pressured by a timer won’t like Numbers Up. While not nearly as important as the speed mechanic, Numbers Up has a memory mechanic that will also impact how well you do in the game. It is important to be able to look at the numbers quickly. While you are looking for the next number though, it is beneficial to try and remember the locations of the numbers that you have looked at as it will save you time later. Even if you don’t have a great memory, you should try to remember the location of the next five or so numbers as it allows you to quickly move onto the next number. Knowing the general area of a number will save you a lot of time as you don’t have to waste time randomly looking for the next number. Having a good memory won’t necessarily win you the game (especially if you are bad at speed games), but it can give you a pretty big advantage in the game. The final element of Numbers Up is an element of luck. While I don’t think luck plays a huge role in the game, it does have some impact. Most of the luck in the game comes from when the gameboard is set up. As you are supposed to randomly set up the gameboard, the gameboard could be setup in a way that is beneficial or disadvantageous to the player. Unless you want to randomly pick pegs, you likely are going to start on one side and systematically move to the other side. If there are a lot of low numbers on the side you choose to start with, you will have an advantage in the game. While I think the fastest player and the player with the best memory have the best chances of winning, the luckiest player will win the game from time to time. At the end of the day, Numbers Up is basically what you would expect it to be. If you think the game’s concept sounds interesting, you should have some fun with the game. If you don’t like speed games, I can’t see you enjoying Numbers Up. I personally had some fun with the game. It is somewhat fun trying to find as many numbers as you can before you run out of time. The biggest problem with Numbers Up is that the fun doesn’t last that long. You can have fun for two or so games and then the game gets kind of repetitive. If you don’t mind just playing a couple games and then putting it away for another day, this isn’t that big of deal. If you want a game that you would regularly play though, Numbers Up is going to get repetitive quickly. At the end of the day Numbers Up is a very average game. It is neither terrible nor good. Other than the game becoming repetitive pretty quickly, I had a few other issues with Numbers Up. While Numbers Up technically supports more than one player, it is basically a solitary game. The game doesn’t technically have a limit on the number of players who can play the game. That is because the game is basically a solitary game where the players compare their scores at the end. There is literally no interaction between the players during the game. Each player takes their own turn trying to score as many points as possible. Whoever scores the most points wins the game. I really don’t see any other way Numbers Up could have been played (outside of having multiple copies of the game), but it doesn’t mean that it is a good multiplayer experience. You end up spending most of your time waiting for the other players to finish their turns. I honestly think it would probably be best to just play the game by yourself and try to beat your previous high score. Second Numbers Up is one of those games where it feels like you spend just as much time setting it up as you do playing the game. The maximum amount of time that a round will take is sixty seconds. If you actually put in time making sure that the numbers are randomly placed on the board, it will take almost the same amount of time. There isn’t a whole lot the game could have done to fix this but it is always frustrating when setup takes almost as much time as the actual game. The final issue I have with the game is that you likely are not going to do as well in the game as you would expect. The game has 20 pegs and you usually will only get around ten of them before you run out of time. Unless you are really lucky or play the game a ton, I don’t see you ever getting all 20 pegs in time. The problem is that you just don’t get enough time in the game. You should be able to improve your score the more you play it, but there is always going to be some reliance on luck. Even with a lot of practice, you are going to have to be lucky to ever get all 20 pegs before you run out of time. Finally before wrapping up I wanted to quickly talk about Numbers Up’s components. There are some things that I like and don’t like about them. I actually kind of like the gameboard as I think the timer mechanic is actually pretty clever. When you run out of time the pegs fall through the board. This prevents a player from playing past the end of their time, and it just looks kind of cool. The problem with the gameboard is that like a lot of these timer based games, the timer is prone to breaking after extended use. When looking at used copies of the game, you have to make sure that the timer still works well. Outside of the gameboard, the pegs are basic plastic pieces. I do think they could have been designed in a way where it would be easier to read the numbers though. I ended up having to waste time just trying to read some of the numbers. This is critical because every second in the game counts. Should You Buy Numbers Up? While it doesn’t play exactly like Perfection, it is pretty obvious that Numbers Up took some inspiration from it. Instead of having to match shapes with their spots on the gameboard, in Numbers Up you have to find the numbers in chronological order from one to twenty. The main mechanic is trying to look through the pegs as quickly as possible. Having a good memory is also helpful as it saves you from having to look for numbers that you have already seen. Finally there is some reliance on luck as the positions of the numbers can make it easier to find more numbers in time. If you like speed games, you can have some fun with Numbers Up. Unfortunately it doesn’t really last as Numbers Up gets repetitive pretty quickly. If you don’t like the concept or speed games in general, Numbers Up is not going to be for you. If you like speed games and the concept, you could have some fun with the game. With how repetitive the game is though, it is something that you will only want to play occasionally. That is why I can only recommend the game if you can find it really cheap. An interesting twist on Perfection. Can be a somewhat fun speed game for a short amount of time. Is a better solitary game than a multiplayer game.